Meanwhile, in large bowl, combine cream cheese and cottage cheese; beat well. Add soup, pimientos, milk, Italian seasoning and garlic; mix well. Stir in onion and bell pepper. Spoon 1/3 of cottage cheese mixture evenly into ungreased 13x9-inch (3-quart) glass baking dish. Stir chicken into remaining cheese mixture. 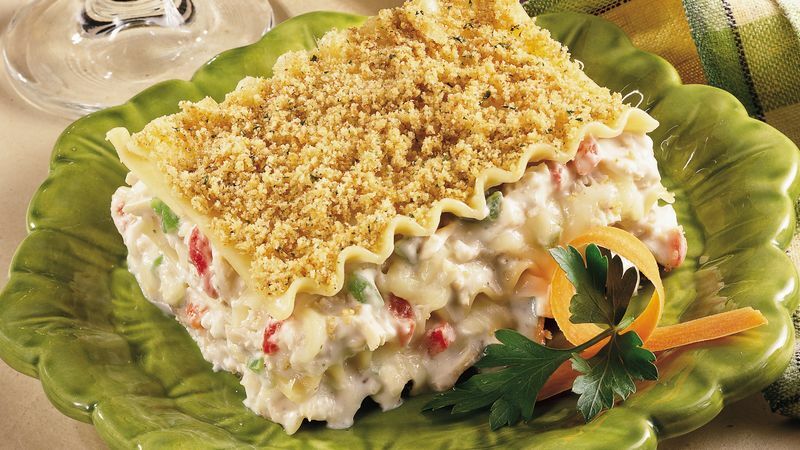 Top cottage cheese mixture in dish with 4 cooked noodles, half of the chicken mixture and 1 cup of the mozzarella cheese. Repeat with 4 noodles, remaining half of chicken mixture and remaining 1 cup mozzarella cheese. Top with remaining 4 noodles. In small bowl, combine topping ingredients; mix well. Sprinkle over top of casserole. Cover with foil. Bake immediately or refrigerate overnight. Heat oven to 350°F. Bake casserole, covered, for 40 minutes. Uncover; bake an additional 10 to 15 minutes or until crumb topping is golden brown. Let stand 10 to 15 minutes before serving. Cut into squares to serve. Pimientos are the familiar stuffing for green olives. A large, heart-shaped sweet red pepper, the pimiento is sweeter and more aromatic than the bell pepper. Pimientos are also dried and ground into paprika. Look for jars of pimiento in the pickle section of the grocery store. Leftover cooked turkey can be substituted for the chicken.